143 InnovativeHealthMag.com When he wasn’t helping to catch criminals or providing important safety tips to the public via the television station’s daily metro Detroit-based newscasts, Ron was on the front lines, working as a paid on-call firefighter and EMT with the Milford Fire Department (and many other departments over the years). He also volunteered with numerous local organizations including Crime Stoppers, The Humane Society, The Autism Society of Michigan, Mothers Against Drunk Driving and The American Lung Association. In short, Ron was dedicated to helping others. He would have wanted his tragic death to prevent someone else from experiencing the heartbreak and loss his wife Mitzi, 16-year-old son Ronnie, and the rest of his family, friends, fans, and co-workers have been left to endure. Maybe this article will save your life—or the life of someone you know. Ron died suddenly on February 25 at the age of 63. He worked his regular reporting shift at Fox 2 the night before, telling viewers tuned into the 10 p.m. news about the search for a suspect in the shooting death of a teenager on Detroit’s west side. 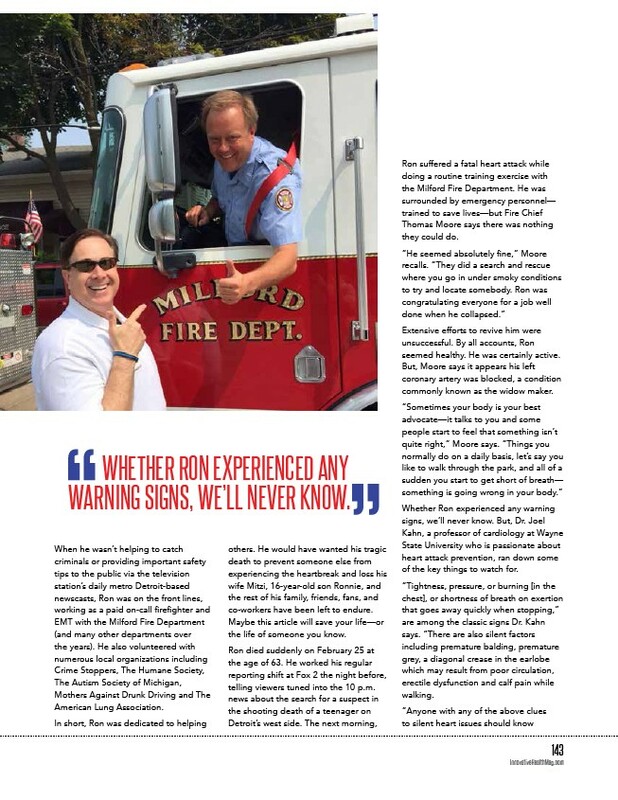 The next morning, Ron suffered a fatal heart attack while doing a routine training exercise with the Milford Fire Department. He was surrounded by emergency personnel— trained to save lives—but Fire Chief Thomas Moore says there was nothing they could do. “He seemed absolutely fine,” Moore recalls. “They did a search and rescue where you go in under smoky conditions to try and locate somebody. Ron was congratulating everyone for a job well done when he collapsed.” Extensive efforts to revive him were unsuccessful. By all accounts, Ron seemed healthy. He was certainly active. But, Moore says it appears his left coronary artery was blocked, a condition commonly known as the widow maker. “Sometimes your body is your best advocate—it talks to you and some people start to feel that something isn’t quite right,” Moore says. “Things you normally do on a daily basis, let’s say you like to walk through the park, and all of a sudden you start to get short of breath— something is going wrong in your body.” Whether Ron experienced any warning signs, we’ll never know. But, Dr. Joel Kahn, a professor of cardiology at Wayne State University who is passionate about heart attack prevention, ran down some of the key things to watch for. “Tightness, pressure, or burning in the chest, or shortness of breath on exertion that goes away quickly when stopping,” are among the classic signs Dr. Kahn says. “There are also silent factors including premature balding, premature grey, a diagonal crease in the earlobe which may result from poor circulation, erectile dysfunction and calf pain while walking. “Anyone with any of the above clues to silent heart issues should know WHETHER RON EXPERIENCED ANY WARNING SIGNS, WE’LL NEVER KNOW.